One of my favourite buddleias is the Weyeriana. 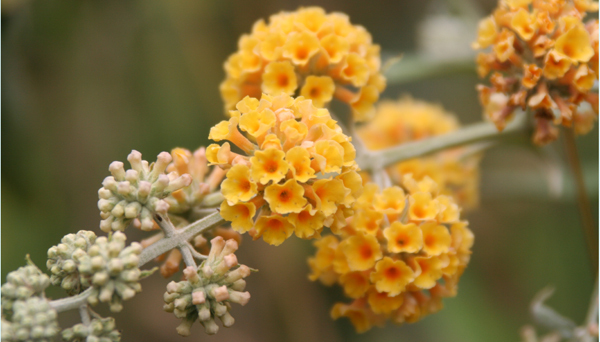 This is a cross between the “ordinary” buddleia davidii and the buddleia globosa – the one with balls of orange flowers. It was achieved early in the twentieth century by Major William Van de Weyer, of Smedmore House, Corfe Castle, Dorset, which is not that far from where I live. It has given rise to a few variations on the theme, some of which are more yellow/orange and others of which are more cream/orange; the most common species available at the moment seem to be ‘Sungold’ (more yellow) and Moonlight (more cream). I think both photos here are ‘Sungold’ – the apparent difference in colour is just a difference in camera and lighting. As ever, there are numerous differently-named Weyeriana cultivars, the differences between which most of us would be hard put to recognise, but if you like being confused, have a look at http://www.buddlejagarden.co.uk. I wouldn’t have it as my only buddleia for attracting butterflies: overall, the purple and white ones are better. 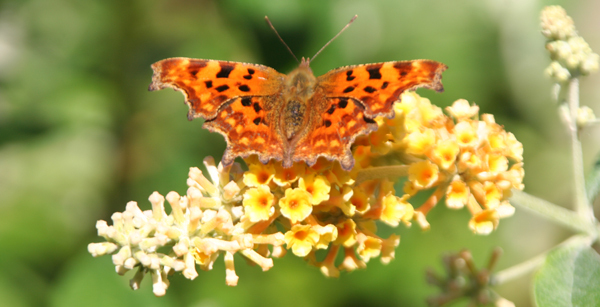 Butterflies will use Weyeriana, though, and its big advantage is that it goes on flowering very late – October or November, depending on frosts: not many flowers, but if there are late butterflies around, these blooms are a very valuable nectar source. In my experience, you can cut Weyeriana back hard, just like the ordinary buddleia, so although it can become a large bush if left – mine is about 10′ (3m) at the moment – it does not have to be huge. Hope your health problems are soon sorted.